THE WAY OF SALVATION, PART I.
F. Come, my children, as our evening meal is over, and the weather is serene and temperate, let us take our seats under the shady trees, which overhang the brook, at the back of the garden, and spend an hour in conversation. M. O how I am delighted to hear you say this! I remember how many pleasant evenings we spent under those large oaks, last summer, and how many pleasant stories you told us, all out of the Bible. J. I have made it a practice to spend some time in that retired spot, evening and morning, for some weeks past, and I have wondered how so many people could prefer lying a-bed, to breathing the sweet air of the garden and groves, early in the morning. B. I love the place too, there are so many birds, warbling their notes in the branches; and so many gay butterflies sailing through the air, and gracefully lighting on the ground. M. O yes, I remember, that I gathered a basket full of wild flowers, and stuck them all around the summer-house, just as if they had grown there; but the next time we came, they were all drooping, and almost withered. F. And have you forgotten what I said these fading- flowers were an emblem of ? M. I don't know what an emblem means. F. An emblem, my daughter, is any natural or visible thing, which has a resemblance to some moral or spiritual thing. J. I remember well, that father said those flowers were an emblem of youth and beauty which must soon wither and fade, as did these flowers. B. Father, will you now tell us some pleasant story? F. My son, we must not be too fond of pleasant things. We must think of what will be profitable. Of late I have felt a great solicitude for the salvation of the souls of my dear children, and I wish now to speak to you of your need of a Saviour. During this conversation, they arrived at the place, and took their seats. J. I am glad to hear you mention that subject, for I heard Mr. Ambrose preach, some weeks ago, on the "worth of the soul." He said that it was more valuable than a thousand worlds, and the loss of it could never be repaired. I have been thinking much about it; and without my seeking, it comes into my mind, and all this day, my thoughts have been running upon it. M. I wish, father, you would tell me what the soul is. I never saw my own soul, or the soul of any one. I do not know what it is like. F. On many subjects, we are all children alike. My dear daughter, I know as little of the nature of a soul as you do. A spirit cannot be seen nor felt, because it has no flesh nor bones. But we know that the soul exists, as certainly as we know anything whatever. M. I know what I see and feel, better than that I have a soul. This book which I hold in my hand, I can see and feel, but cannot see and feel my soul. I feel surer that I hold this book, than I can be of what 1 never saw. F. My child, you deceive yourself Who sees that book? M. Why I see it with my eyes, and feel it with my fingers. F. But who is this you call I. Is not that your soul? If you had nothing besides your body, you would know no more about that book than the stone under your feet does. Your eyes, and your fingers, are only instruments that bring sight and feeling to your spiritual part; which, in mankind, is called the mind or soul. If there is any difference, we are more certain that we have a soul, or that the soul is ourself, than of any other thing; for every time we see, or feel, or hear, or taste, or smell, we are conscious, that is, we are certain in ourselves, that our soul sees, feels, hears, tastes, and smells. Try, Mary, to stop thinking for one moment. F. Well, can any thing think but a soul? Every moment, therefore, you have a certainty that you have a soul. M. But after all, I do not know what the soul is. F. No, nor do I, except that it is that which thinks, and feels. But we know as little of what we see and feel. Here is a pebble; you see it is white and round. You take it in your hand, and it is smooth and fills up a certain space, so that you cannot shut your hand close. But what is that which is round and white and smooth and extended? You can tell no more about it, than you can of your soul. R. Father, does the soul grow like the body! and is the soul of a man larger than that of a child ? F. You have fallen into a common error. You are endeavouring to give to a spirit the properties of a body. Size and shape belong to matter but not to spirit. But in one sense the soul grows as much as the body, and may grow long after the body has reached its full size. The soul increases or grows in two ways; first, its faculties are by degrees brought into exercise and become more vigorous from day to day; and again, the mmd is enlarged by an increase of knowledge. J. I like to hear you converse about the nature of the soul, but what I most want to hear is about the salvation of the soul; for what good would it do me to know ever so much about my soul, if at last it should be lost? I cannot help thinking about our pastor's text~»What is a man profited, if he shall gain the whole world, and lose his own soul, or what shall a man give in exchange for his soul? F. I am pleased, my son, to hear you speak so seriously about the worth of the soul. To secure its salvation is surely the one thing needful. 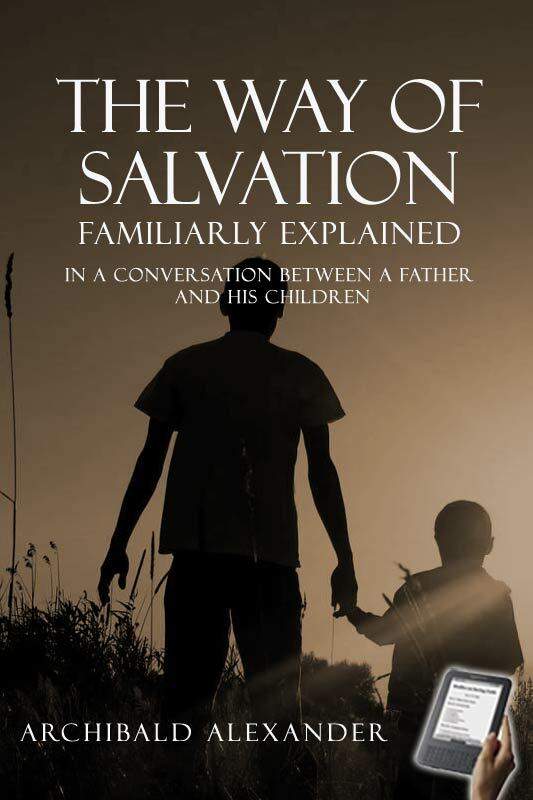 B. I wish, Father, you would explain how the soul came to be in need of salvation; for our pastor said that if it were not lost, it could not be saved. Now, I thought that if it never had been lost, it would be sure to be saved. And would not man have been saved, if he had never sinned? F. He would have been safe and happy as the angels are, but he could not with propriety be said to be saved. A man who has never been sick is well, but you cannot say he is healed. That applies only to such as have been sick. To save any one is to deliver him from ruin, into which he has fallen or to which he is exposed. None can be saved, therefore, but lost sinners. B. I understand this now ; but how did we all become sinners? A holy God could not create us sinners. F. No, my son, to say this would be blasphemy. God created every thing good according- to its kind. And it is declared that he made man "in his own image, and after his own likeness;" that is, he was created in knowledge and holiness. I think, Benjamin, you could answer your own questions if you would only recollect your Catechism, which you repeated last evening. "Did our first parents continue in the estate wherein they were created?" B. "Our first parents being left to the freedom of their own will, fell from the estate wherein they were created, by sinning against God." F. Very well, there you have it; and what is the Scripture proof which you learn? B. "As by one man sin entered into the world, and death by sin, so death passed upon all men, for that all have sinned." B. But, Father, how could one man's sinning- make all men sinners? F. In two ways. All Adam's posterity are made sinners by his sinning: First, because he stood for them, and acted for them, in what is called the first covenant: that is, the agreement which God made with Adam that if he obeyed him he should live, but that if he disobeyed him, he should die. Thus, when Adam sinned, and so broke that covenant, all mankind sinned in him, or his sin was theirs also, because they were included in the covenant. Secondly, our first parents having lost the image of God, and corrupted their nature, their posterity are all born in the same destitute and corrupt state. What other text have you on this subject? B. We "were by nature, children of wrath, even as others." "I was shapen in iniquity, and in sin did my mother conceive me." M. Why, I thought some people were good and some bad. F. No, my child, "there is none righteous, no not one." " All have gone out of the way." "There is none that doeth good." M. Dear father, are you not good? Yes you are, I know you are. F. No, my child, I am by nature no better than others, and if I now differ from the worst of men, it is all owing to grace. "By the grace of God I am what I am." I have daily evidence of the most convincing kind, that in me, that is in my flesh, dwelleth no good thing." For every good thought and feeling, for every good word and work, I am indebted to the grace of God. M. And our minister, was he born in sin? F. Yes, my child, he confesses it every time he prays, and this is the doctrine which he preaches every Sabbath. J. How does it come to pass, that while all are sinners by nature, and without holiness, some men are moral and amiable from their childhood, and others are wicked all their lives'? F. It is not owing- to any essential difference in natural character, but some persons are from their youth under various restraints, which keep them from running so far astray in their actions as many others. Early instruction, a fear of shame, a dread of punishment, and the absence of strong temptations, are the means of restraining many. To all which, we may add the secret influence of the Spirit, in what are called his common operations, by which they are kept in a state of tender moral feeling, and are sometimes under strong convictions of their sin and danger. M. Are no children good from their earliest age? May not young children be made good as well as grown people? F. They may be sanctified from their birth, as was John the Baptist, and Jeremiah, and perhaps Samuel; but experience teaches, that few give evidence that this has been their case. M. What then becomes of young children? If they are born in sin must they not be lost? F. Now, my child, you are indulging a vain curiosity. What good can it do you to know what becomes of those who die in infancy?God has not told us, and we ought not curiously to inquire into secret things which belong to God. We know that God can save them, and we have no evidence that he will not. M. Perhaps it would have been better for me if I had died when my dear mother was taken away. Nurse says my life was despaired of. F. Now, Mary, you are sinning against God, by unthankfulness for the goodness which has preserved your life, and raised you up from the borders of the grave. It is true, if you continue in impenitence until you die, it would have been infinitely better for you to have died before you committed actual sin; but life, especially under the gospel dispensation, is a blessing for which we are bound to be thankful. For now you have opportunity to hear the Gospel, and if you believe, and repent of your sins, you will be saved. Why then should you wish that you had died? I hope you will never again utter such a speech. Your dear mother, when dying, requested—and it was her last request—that if you lived, you should be brought up "in the nurture and admonition of the Lord," and she, with her latest breath, commended you to God. And now, my dear child, it is your duty, it is for your salvation to turn unto God with all your heart. Seek the Lord early while he may be found. J. If man had not sinned, as he would have needed no salvation, of course no Saviour would have been provided; but what I wish to know is, why God could not save sinners without sending his own Son to die. I know that man is in a ruined state, and must perish unless he is saved from it; but why could not God, if he desired it, stretch out his omnipotent arm and rescue him ? F. God is under no obligation to save any sinner. As his law is just and good, he might let it have its course, and inflict deserved punishment on all who transgress. Thus he passed by the fallen angels, and left them to their doom, and thus in regard to the children of men, he shows mercy to whom he will— choosing some nations, and leaving others in the darkness of idolatry; electing some persons to life, and leaving others to pursue their own course. But when he determines to save sinners, it must be in a way consistent with the holiness of his nature, and not derogatory to his law. Sinners cannot be saved by a mere exertion of Almighty Power. The hinderance cannot thus be removed. God must be just in justifying the ungodly. The law of God must be satisfied, or the sinner cannot be saved. This rendered it necessary that there should be a mediator; and he must be one who could make satisfaction to law and justice, for the sins of men. None could do this, but the Son of God; and the Son of God could reconcile men to God, only by becoming man. J. I always think of this with wonder. It seems to me the most wonderful thing in the Bible. I often ask myself, " how could the Son of God become man?" M. Brother, I can tell you out of the Catechism. " The Son of God became man by taking to himself a true body and a reasonable soul, being conceived by the power of the Holy Ghost in the womb of the Virgin Mary, and born of her, yet without sin." R. I never thought before that the Catechism could teach us so many things. F. Well, my son, I hope you will hereafter be more attentive to commit the Catechism perfectly to memory, and also some few texts of scripture which are annexed to each question to prove the doctrine; for if the Catechism did not teach according to the Holy Scriptures, it would be of no authority. It was intended to contain a short summary of what is in the Bible. R. Why are there different kinds of Catechisms'? At our Sunday School some learn the Shorter Catechism, which we use, but others recite the Heidelberg Catechism ; and William Van Sickle says, that their minister hears all the children in his congregation from that Catechism every Saturday afternoon, in the lecture room. F. My son, that is the Catechism which has for a long time been used in the Reformed Dutch Church in Holland, and when the Dutch settled in this country they brought it with them; but my ancestors were from Scotland, where the Westminster Catechisms have been long in use, and they have been adopted as the Catechisms of the Presbyterian Church. The Shorter Catechism has always been highly valued, and much used by the Congregationalists of both Old and New England. But the Heidelberg Catechism has been more extensively used than any one composed by the Reformers. All the reformed churches on the continent of Europe adopted this Catechism. These two Catechisms perfectly agree in doctrine, and only differ in words and method. J. Father, if it would not take too much time, I should like to hear you state the reasons why man needs a Saviour, and afterwards show that Christ is just such a Saviour as the sinner needs. F. My son, I will do my best to satisfy you. The subject is important beyond conception, and I humbly pray that I may be guided so as to hold forth the truth of God, and nothing but the truth. I will enter on the task with the more pleasure, because I hope that you are beginning sincerely to inquire after the way of salvation. And I beg of you all, my dear children, to give diligent heed to the instructions of your affectionate father, or rather to the counsels of God, your Heavenly Father; for his word is able, through faith in Christ Jesus, to make you wise unto salvation. R. Father, when we do not understand any thing, may we ask you to explain it ? F. Certainly you may, and it will afford me pleasure to give you all the information I can. I never feel more in the way of my duty, and no duty affords me more heart-felt pleasure than to instill divine truth into the minds of my children, especially when I find them ready to hear and eager to learn. J. I wish you would begin with that want of the sinner, which is most pressing and most heavily felt. When the jailer at Philippi, asked, What must I do to be saved? what want did he feel, what kind of salvation did he inquire after? F. Your suggestion is very reasonable. Often for the sake of proceeding systematically in our instructions, we begin too far off from the feelings of distressed souls. It is evident, I think, that a sense of guilt, or of exposure to condemnation, causes the most urgent of all the sinner's wants, and is that which is usually first experienced in the conviction of sin, produced by the Holy Spirit. Most people brought up under the Gospel have a general and habitual conviction that they are sinners. The frequent reproofs of conscience are sufficient to keep them from denying this; and as all are ready to make this confession, no peculiar disgrace is attached to the acknowledgment. But while they admit that they are sinners, they are disposed to excuse themselves, and cherish the opinion that they are better than most others; and the general conviction of sinfulness makes no impression on them. They are neither humbled nor alarmed by the thought that they are sinners; and, except when the fear of death is excited, they have no sense of their need of a Saviour. They give themselves up to worldly pursuits and pleasures, with as much eagerness as if they were sure there was no world to come, or as if they had no account to render to God for their sins. The case which I am describing is so common, that it is often hard to find, in a whole congregation, a few persons in good earnest, seeking the salvation of their souls. But sometimes, it pleases God to pour out his Spirit, and then many are awakened, and there is, for a season, a general concern about the salvation of the soul. B. Is that what is called a revival? F. It is; and such seasons are very precious. Many who were far off from God are brought nigh, and the wicked forsakes his way, and the unrighteous man his thoughts, and returns unto God and obtains mercy. J. Does all seriousness proceed from the Spirit of God, or may we not be led to think and feel on religious subjects by awakening discourses or alarming dispensations of Providence? F. As God works by means, we can never tell certainly, whether a serious thought or feeling is merely from the operation of God's word and providence, or whether the Holy Spirit gives an unusual energy to the means. It is safest, however, and attended with no danger to attribute all serious impressions to the Spirit of God, giving force to considerations which before passed unheeded by us. J. How can we know that we are under conviction of sin from the Spirit? F. As we cannot perceive the Spirit's operations, but by the effect produced, so if we have an abiding and deep conviction of our sins, we know that this effect is produced by this Divine agent. J. I wish to know how persons feel who are under conviction. I am very sensible that I am a sinner, and I feel that I am a great sinner, but my heart remains hard. I have no tender feelings. Formerly, when I heard a solemn sermon, I was moved to tears; but these feelings soon passed away. Now, I seldom shed a tear, and when I do, still my heart feels as hard as a stone. I wish to be alarmed at the terror of the Lord, but I seem incapable of fear, and when I attempt to pray, it seems like a mockery; for when 1 am on my knees, my thoughts wander and have nothing to say ; or if I go over a form of words, my heart does not go along. I think, dear father, that mine must be the hardest and the wickedest heart that ever was lodged in any breast. I begin to fear that the Spirit of God has left me to myself, and that I am only permitted to live to fill up my cup of iniquity to the brim. Do tell me what I must do. F. My dear son, though your feelings are painful, I rejoice that you have them ; and I assure you they are not peculiar to yourself. Thousands have experienced the same. I cannot express the feelings which I have in finding you so earnestly exercised about your salvation. I have been, I confess, too negligent in conversing with you about your soul's concerns. I lament my backwardness and unfaithfulness in this particular. But I have felt much solicitude for the salvation of my children, and have often borne you on my heart at a throne of grace, with many tears, day and night. And now, I hope that God is about to answer my poor but sincere prayers. J. I am afraid that I have given you an entirely wrong view of the state of my mind. It is true, that for several weeks past this subject has been in my thoughts, and I have wished to experience some deep impressions, and have been willing to feel the strongest convictions. Indeed, I have tried to produce such feelings by thinking on the most awful subjects, but instead of getting my heart softened, it has every hour been growing harder. You lately presented me with a copy of Doddridge's "Rise and Progress of Religion in the Soul," and requested me to read it, especially the former part; remarking that if you had ever received any spiritual blessings, you owed much, under God, to that book. Two days ago I took down the book and carefully perused several chapters; but although my understanding assented to every thing-, yet I was able to feel nothing-— nothing- but hardness. And now what I wish above all things is, to feel conviction of sin, as I understand that to be the first step in Christian experience. Do tell me how I may get conviction—I care not how painful or terrible. I wish to be prepared to receive Christ. F. Your notions of conviction I think are erroneous ; and also of the end which it can accomplish. You seem to think that conviction of sin consists in very tender relentings, or in awful terrors of conscience, and therefore, that you now have no convictions; but such feelings as you wish for, would not give such a true sense of your sinfulness as you already experience. If you had the feelings desired, you would think your situation better than you now view it to be. Much of the depravity of the heart consists in its unyielding hardness. To be deeply convinced of this is then a more real and thorough conviction of sin, than what you are wishing for. And you seem to think that such feelings as you have been seeking would prepare you to come to Christ. This is the working of a self-righteous spirit, which desires to come with something that deserves favour. But no feelings of distress, however keen, would in the least fit you for the reception of Christ. You can have no fitness, but to feel your need of him. This is all the fitness he requires, and that you have now, if you feel that you need a Saviour. Conviction is in no other view a preparation for believing in Christ, than as it shows us that we are in a lost condition, and utterly unable to help ourselves; and that we must perish, unless mercy interpose: and the effect is not complete unless we see and feel that it would be just in God to cast us off forever. This is a point, my son, on which you have not expressed your feelings. J. I am glad you mentioned it. Last evening- I walked in the grove, and was meditating on my lost and miserable condition, and the thought came into my mind, that my day of grace was past, and that my sins were too great to be forgiven. This suggestion appeared so much like an evident truth, that, for the time, I fully believed it. I was, however, calm, and felt no peculiar terrors, but began deliberately to think what my condition would be in the world of woe. I had often heard that lost sinners in hell would for ever blaspheme God, but I thought that I never could join in their blasphemies. I thought that God had not only been just, but kind towards me. I was fully convinced that he was in no degree to blame for my perdition, but that all the blame would lie on myself. And I had, at that moment, such a sense of the righteousness of God, in my condemnation, that I seemed to acquiesce in my being sent to hell, as a thing that a holy God must do. I never saw any thing plainer in my life, than the entire justice of God in my eternal condemnation, and this when I seemed to be certain that it would be my doom. P. I am satisfied on this point, and I see nothing to hinder you from immediately committing "your soul into the hands of Jesus, who is waiting to receive you. " He is able to save them to the uttermost that come unto God by him, seeing he ever liveth to make intercession for them." "any man sin, we have an advocate with the Father, Jesus Christ the righteous; and he is the propitiation for our sins, and not for ours only, but for the sins of the whole world." He invites sinners to come unto him, and promises, " Him that cometh unto me, I will in no wise cast out." And he requires no preparation—no previous cleansing, no particular degree of conviction. Come helpless, come just as you are, come as a self-condemned sinner—and come now. " Behold now is the accepted time, and now is the day of salvation." Lay hold of eternal life, for by accepting Christ, you have life. The sceptre of his mercy is extended towards you—touch, and your soul shall live. J. Oh Lord! I would believe—"help thou my unbelief." M. Dear father, let us return to the house. Is brother John sick? Why does he cry so? F. Be still, my daughter; I hope God is dealing graciously with your elder brother, and I wish from my heart that all my dear children were affected as he is. THE WAY OF SALVATION. PART II. The father having agreed to spend the next evening in the same sequestered and delightful spot, the children were all punctually there by the appointed hour. John no longer appeared dejected; the dark clouds, which had shaded his youthful countenance, were dispersed, and a calm serenity rested on his brow, while hope and joy seemed to speak through his eyes. His heart was indeed at rest, for ho seemed to lean gently on his Saviour's bosom. But he did not appear forward to speak ; he seemed rather to wish to be left undisturbed to the sweet repast of love and joy with which he had been favoured. The other children were overawed and were still. The father, who had had a loner interview with John, was unable to conceal his swelling- emotions. Tears of joy trickled down his cheeks, and he looked around upon the little circle of his children with a tenderness and a solicitude, which he had never before felt in an equal degree. After some time of tender silence, Benjamin ventured to speak. B. Father, I wished to hear you explain more fully why it was necessary for God to send his own beloved Son into the world to save sinners. F. I told you that God is so holy that he cannot suffer sin in any of his creatures to go unpunished. The sinner, therefore, must die, or some one must die in his place. And the law of God is holy, just and good, and cannot be set aside. It must be honoured and fulfilled, which could not be if sinners escaped the deserved penalty. God had threatened death as the punishment of every sin This awful word includes every kind and form of death, and every evil which ever shall come upon man. No angel could be permitted to be a mediator between God and man, for angels are dependent creatures, and can perform no works which are not required of them by the law under which they are placed. An angel could not endure the curse due to so great a multitude. A person of infinite power and dignity was requisite; and where could such a one be found but in the Godhead? For though God is one in essence, yet he exists in three persons, united and distinguished in a manner which can neither be expressed nor understood. This glorious mystery is made known in connexion with the plan of redemption. The eternal Father agreed to give his only begotten Son to become man and to die for sinners. The coequal Son consented to be made flesh and to dwell among us, and bear our sins in his own body on the cross. The Holy Spirit entered into the counsel of peace, and undertook to prepare the human nature of the. Mediator pure and spotless, by a miraculous birth, and to fill and consecrate this sacred but peculiar nature, with the immeasurable fullness of his grace ; and also to apply the redemption purchased to all the chosen sons of God, and to prepare them and preserve them for the heavenly inheritance. In the fullness of time, the Son of God was manifested in the flesh, and having brought in an everlasting righteousness by his obedience and death, he returned to heaven, where he is now enthroned in glory. R. Father, most of what you have said is in the Catechism. I have been reviewing my questions almost the whole day. F. Well, Rufus, let us hear what you can remember on this subject. R. "Christ's humiliation consisted in his being born, and that in a low condition; made under the law, undergoing the miseries of this life, the wrath of God, and the cursed death of the cross; in being buried and continuing under the power of death for a time." F. Very good. Let us hear now whether Mary can tell us wherein Christ's exaltation consists. M. No, father, I can't remember it unless you ask me from the beginning. F. Rufus, you can give it to us, as you have just been over it. R. "Christ's exaltation consisteth in his rising again from the dead on the third day; in ascending up into Heaven; in sitting at the right hand of God the Father; and in coming to judge the world at the last day." B. You did not finish telling us why God could not forgive our sins without an atonement. F. True, my son, I was led away from the subject by the interesting inquiries of your brother John; but I think from what has been said, it must be evident to every impartial mind that the holiness and justice of God can never suffer sin to be pardoned, except on account of a full satisfaction. No other person was qualified to render such a satisfaction but the Son of God; his atonement therefore is the only ground on which a sinner can rationally or scripturally hope for the forgiveness of his sins. But not only the holiness and justice of God, but his truth and faithfulness are pledged to punish sin; and there is no way by which the veracity of God can be vindicated and honoured if the sinner escape the punishment of his sins, unless some one step into his place and die for him. The curse of the law must be endured, either by the transgressor, or by his surety. "Cursed is every one that continueth not in all things which are written in the book of the law to do them." This, God hath solemnly spoken, and if he fail to execute his own threatenings, where is his truth"? Such a failure in a man would be considered very wrong, and shall man be more true than God? B. But, father, did not God say to Adam, "in the day that thou eatest thereof, thou Shalt surely die?" and yet he lived almost a thousand years. F. My son, there are more kinds of death than one. The word "die" in that place includes all kinds of punishment. And in the most important sense of all, Adam did die immediately upon sinning; for he was separated from his union and communion with God, in which spiritual life consisted, and he became dead in sin, and dead in law. and in due time his body also died. J. I love to think of Christ on the cross, bearing our sins in his own body. "He who knew no sin was made sin for us." He came to redeem his people from the curse of the law, by being made a curse for them. If I did not see the holy law of God completely fulfilled in Christ, I could have no hope. Now God can be just and justify the ungodly that believeth in Jesus, because he hath found a ransom. Christ is the propitiation for our sins, and his blood cleanseth from all unrighteousness. I wish that the whole world could see the excellency of Christ as I now see it. He is indeed the chief among ten thousand, and one altogether lovely. F. John, you speak with feeling and energy, because you speak from the heart. I rejoice in your comfortable views and feelings, but I must forewarn you that this sunshine will not be uninterrupted. Cloudy days, if not dark and stormy nights, must be expected by Zion's pilgrims, as long as they are journeying through this wilderness. And you will find that you will greatly need a skilful guide to direct you in the right way, and to bring you back when you have strayed. The need of Christ's atoning blood and justifying righteousness is first felt and a!ways felt; but it is not long before he becomes precious to the believer, in his prophetical office also. No want is more sensibly experienced than the want of spiritual knowledge, which none can supply but Christ, by his Spirit. We need instruction every day and every hour. We need a spiritual discernment, without which nothing is known aright We need wisdom to comprehend the things which are freely given to us of God, and to enable us to order our conduct aright. We need a meek and docile spirit, that we may be apt to learn, and we need such a measure of Divine knowledge as may make us useful to others. Mary, can you tell us how Christ executes the office of a prophet ? M. "In revealing to us, by his word and Spirit, the will of God for our salvation." J. O father, how briefly and plainly this is expressed. I shall begin now to love the Catechism. I will go over it all, without delay. R. What, father, better than the Bible ? F. We never compare any human composition with the Bible. The excellence of this Catechism is, that it embodies, in a short space, the most important doctrines and duties inculcated in the Bible. J. I do not see so clearly as I wish, why the Mediator should be a King. I wish, father, you would make some remarks on this subject. F. The work of redemption is a great and complicated work. None could accomplish it but one possessed of Almighty power. Man had fallen under the dominion of an enemy whom it was necessary to conquer, in order to his deliverance. His own sinful passions and propensities must be subdued, and a victory must be obtained over the world, which he has hitherto served. When he is brought into a state of reconciliation, still he remains, while in the body, in an enemy's country, where he is liable to be assailed by numerous foes. To oppose these, he has no power in himself. He would fall, if left to himself, by the hands of the weakest of his enemies. He needs a Captain of salvation to protect him, to teach him low to carry on this spiritual warfare, and to give him the victory over his enemies. On ail these accounts, his Redeemer must be an all-powerful King. Again, the promises of God to his people, in the covenant of grace, require, that he who undertakes to accomplish them should have dominion over all the elements, all the laws of nature, and all the creatures of God, intelligent as well as irrational. So we read, that principalities are subject to Christ, and all the angels are his messengers—" ministering spirits, sent forth to minister for them who shall be heirs of salvation." Christ also must be gloriously exalted as Mediator, as a reward for his deep humiliation. "Who being in the form of God, thought it not robbery to be equal with God, but made himself of no reputation, and took upon him the form of a servant, and was made in the likeness of men. And being found in fashion as a man, he humbled himself, and became obedient unto death, even the death of the cross. Wherefore God also hath highly exalted him, and given him a name, which is above every name; that at the name of Jesus every knee should bow, of things in Heaven, and things in earth, and things under the earth." Ph. ii. 6—10. J. What wonderful wisdom shines in the plan of salvation; and not only wisdom, but love and mercy, beyond all human thought! And what is most wonderful, justice shines as brightly in the salvation of a sinner as mercy. F. The method by which grace reigns through righteousness unto eternal life, is, I believe, the most glorious exhibition of the Divine attributes which has ever been made in the universe. While man reaps the benefit of it directly, all holy beings must be benefitted to all eternity by this wonderful display of the Divine attributes; for their dignity and happiness depend on the clearness of the knowledge of God to which they can attain. B. Father, I should like to hear you, in a few words, give a view of the way of salvation. F. I scarcely know how to comply with your request. I hardly know where to begin, or having begun, where to end. Paul has given it in one sentence. "For by grace are ye saved through faith, and that not of yourselves—it is the gift of God." The whole is a plan of mere mercy and grace. It originated in pure love. "God so loved the world that he gave his only begotten Son," The undertaking of the work of redemption by the Son was of unmerited favour—"As Christ also hath loved us and hath given himself for us." "As Christ also loved the Church and gave himself for it." 1. A revelation of the truth. 2. A perfect obedience to the law, rendered in behalf of his people. 3. A full atonement for their sins, when he bore them in his own body on the cross, and was made a curse, to deliver his people from the curse of the law. 4. His resurrection, and his continual intercession for all that were given him of the Father. 5. The mission of the Holy Spirit to convince them of sin, to regenerate them, and bring them by faith unto Christ. 6. The progressive sanctification and conservation of believers; by defending and protecting them from all enemies, and keeping their graces alive; by reclaiming them when they go astray ; chastening them for their improvement in holiness; supporting and comforting them in all their afflictions, and finally giving them a victory over death, and ministering to them an abundant entrance into the everlasting kingdom of our Lord and Saviour Jesus Christ. 7. Christ has also given assurance by repeated promises, that he will come again to receive his people, and openly acknowledge them before the assembled universe ; when their bodies shall be raised from the dust, and shall be fashioned like unto his glorious body. Then shall they be caught up into the air with him, and shall ascend with him to Heaven, where they shall ever be with the Lord. The riches of that inheritance which Christ has purchased and prepared for them that love him, far exceed all human conceptions. But we know that it is " incorruptible, undefiled, and fadeth not away." Then the redeemed shall stand distinguished on Mount Zion, as "they which came out of great tribulation, and have washed their robes and made them white in the blood of the Lamb ;" and freed from all sin, and filled with gratitude, they will never cease from praising God and the Lamb. And they shall go no more out, but shall be as pillars in the temple of God. Blessed is every one that shall be privileged to join in the hosannahs and hallelujahs of the temple above. B. What I wish more particularly to know is, the way in which God brings a sinner back to himself, or what are the views and feelings of a sinner returning to God hy faith and repentance. F. The ways of God's dealings with those whom he effectually calls, are exceedingly various in many respects, but as to substance, the result is the same. Rufus, let us hear you give the answer to the question, " What is effectual calling?" R. "Effectual calling is the work of God's Spirit, whereby convincing us of our sin and misery, enlightening our minds in the knowledge of Christ and renewing our wills, he doth persuade and enable us to embrace Jesus Christ, freely offered to us in the Gospel." F. The first step in a religious life is serious consideration; the next is a sincere desire to escape from the danger of perishing eternally. At first, outward sins and great sins affect the conscience; but as light and knowledge increase, the affections of the heart are discerned and felt to be sinful. The convinced sinner's first thought is to satisfy the broken law by reformation, or by prayer and penances ; but when he sees that "the heart is deceitful above all things and desperately wicked," he despairs of help from the law. The light of conviction is so strong in some, that they are cut off from all legal hope almost instantly; while others may be months and years striving to work out a righteousness of their own. Nothing is harder, than for a man to give up all hope of saving himself; he catches like a drowning man at every thing within his reach. But when this hope is dead, he feels as if he were sinking, and begins to cry in good earnest for mercy and help. He is taught and made to acknowledge, that though he can do nothing good, yet his inability is his sin, and not his apology. He is deeply convinced of the sinfulness of his nature, and of the exceeding sinfulness of sin, and that in him dwelleth no good thing; that he deserves to be made forever miserable; and that if he is saved, it must be by mere grace ; yet he is resolved to die seeking for mercy, if die he must. One of the most common feelings of a convinced sinner, is a deep sense of the dreadful hardness of his heart and blindness of his mind, which he often thinks is peculiar to himself. J. Dear father, how exactly you describe my feelings. F. Well, my son, tell us how you felt when you hoped that you had received Christ. J. I am afraid to say that I have believed—it seems too great a good to be mine. I am sometimes afraid that I am deceiving myself; but I cannot doubt that I have viewed Christ as lovely and as a Saviour suited to me. After giving up all hope of salvation, while you were conversing with me, and repeating God's gracious promises, I felt my hard heart begin to melt—I began to think that God could save me through Christ, and the mere possibility of being saved, filled me with such emotion as I never felt before. This morning when I awoke from a sweet sleep, my thoughts were raised to God, and I believed that he was my reconciled Father in Christ. Humble joy filled my soul. I arose, and before I had finished dressing, I took up my I Bible and opened at the eighteenth chapter of John. I read this chapter and the next, and it was as if a new book had been put into my hand. The sacred pages appeared to be illuminated with beauty and glory. I knew then most assuredly that this was the truth of God; and while tears of penitence flowed, at a view of the sufferings of Christ, I felt confident that I trusted in Him, and that He had become my Saviour. If I ever loved anything, I experienced love to Christ, and his love seemed to be shed abroad in my heart. After this season of joy and sorrow sweetly mingled, a delightful peace seemed to be diffused through my soul, which still continues, but I am afraid is decreasing. My strongest desire was to show my gratitude to my dying Saviour for his love. The language of my heart was, "Lord, what wilt thou have me to do?" And immediately I was conscious of a most enlarged benevolence to my fellow creatures, and a strong- desire to invite the whole world to come to Christ, that they might be saved ; and also a tender affection to the people of God, and to the ministers of Christ's Gospel. And my heart firmly resolved and vowed to spend all my days in the service of God my Saviour. F. I do not know, Benjamin, that I need say anything more. If God draws you to himself, as I hope he has begun to do, you will understand these things in another manner than you can now by any description. "Oh, taste and see that the Lord is good ; blessed is the man, that trusteth in him." M. Was not my dear mother pious? Is she not gone to heaven ? F. I hope so, my dear daughter. I believe she was a true Christian from her youth. M. How old was she when she joined the Church? F. I was not acquainted with her then, but I have heard her say that she thought she loved Christ when she was a little child. But she was not permitted to go to the Communion, till she was fourteen years of age. M. Would it be wrong for me to wish that she would pray for me, now she is in heaven? F. We read nothing in the Bible of departed saints praying for their friends on earth. We know not whether they pray at all. All their work is to praise. But you need no other mediator to intercede for you but Christ only, and He is willing to be your advocate and to ask God to forgive your sins, and adopt you as his child. M. Well, father, I wish to be a Christian, and I am sorry that I have often been a naughty child. I hope God will forgive me. Do, father, pray for me, and for us all, that we may get to heaven and be for ever with our dear mother—and what is far better, be with Christ who loved us better than any father or mother could do. Christ, whose glory fills the skies, Christ, the true, the only light, Sun of righteousness, arise. Triumph o'er the shades of night; Day-spring from on high be near, Day-star in my heart appear. Joyless is the day's return. Glad mine eyes, and warm my heart. Visit then this soul of mine. Pierce the gloom of sin and grief; Fill me, radiancy divine, Scatter all my unbelief; More and more thyself display, Shining to the perfect day. And live and move in me; Make my every deed thine own. In all things led by thee: Bid my sins and fears depart. Lord, manifest in me; Son of God, I cease to live. Unless I live to thee: Make me choose the better part. Jesus, the sinner's only trust. Let me now feel thy grace infused; Ah, raise the fallen from the dust, Nor break a reed already braised ; Smile on this cheerless heart again, Nor let me seek thy face in vain. Let thy meek mind descend on me, Thy Holy Spirit from above ; Assist me. Lord, to follow thee. Drawn by thy endearing cords of love Made perfect by thy cleansing blood, Completely saved, and born of God. Be all my Saviour taught, Do as Jesus bids me do. And think as Jesus thought! Meek Redeemer now impart Thine own humility. And all thy mildness gain ! Give me, Lord, thy gentle heart. Tear away my every boast.